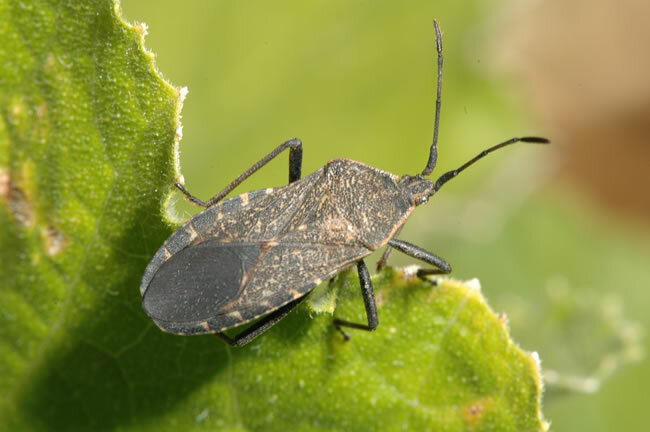 Here's another common pest we should all be on the lookout for: the squash bug. If you don't kill this critter, you'll end up with a bunch of neat little patches of eggs that look like this. Just like with squash beetle eggs, gently scrape these off with a fingernail or perhaps the edge of a credit card, if you've just paid for a French polish. If allowed to hatch, an army of baby bugs from your nightmares will pick up right where mom left off, piercing and sucking sap from the tender leaves, resulting in wilt and possibly plant loss. Squash bugs are more wily than their partners in crime, squash beetles. They are more likely to fly off when spotted. The best technique is to swat them to the ground, then deal them a death blow with a trowel or other blunt object, being careful, of course, not to harm nearby plants.